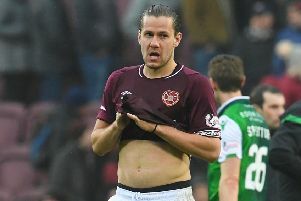 John Robertson believes Aaron Hughes can have the same steadying influence on Hearts’ youngsters as the late Sandy Jardine more than 30 years ago. Hughes, 37, signed a six-month contract with the Edinburgh club on Monday to provide experience in defence. Robertson, the club’s record league goalscorer, believes the Northern Ireland veteran can have the same effect Jardine had on young Hearts defenders Craig Levein, Dave McPherson and Tosh McKinlay in the 1980s. He expects the likes of John Souttar, Liam Smith and Callum Paterson to benefit from Hughes’ presence. “It’s an interesting one because the mandate was to bring in players to improve and sell on, but the squad has needed experience,” admitted Robertson, who works at Tynecastle in a commercial role. “Aaron Hughes is 37 and I played with one of the great Scottish defenders who won a Scottish player of the year award at 37 – Sandy Jardine. His influence on Craig Levein, Dave McPherson and Tosh McKinlay was incredible. “Can Aaron Hughes do the same for John Souttar, Igor Rossi, Liam Smith, Callum Paterson? Of course he can. Hughes and left-back Lennard Sowah became head coach Ian Cathro’s first signings and Robertson expects more to follow. “They are genuinely looking to improve in all areas,” he said. “If they find someone who is better than what they already have and can improve the squad they are going to try and bring them in. “It’s been put out that there were funds available for Robbie Neilson [Cathro’s predecessor] and we are hoping that, not only is that money still available for Ian, but with Alim Ozturk and Juanma going there could be more money freed up. “You hear rumours of six out, six in. Will that happen? Possibly. The main men will make those decisions. “Trying to get the quality that you require in January is sometimes harder than it is in the summer, but we’ve had a very good record with that. We’ve brought in the likes of Perry Kitchen and Arnaud Djoum after the window as free agents. Despite the changes, and the fact Cathro is just four weeks into his new job, Robertson doesn’t believe this season should written off as a transition period. “Speaking to Ian and Austin, their outlook is no different to Robbie’s. They want to finish as high up the league as possible. It’s hard when you come in during the season. I had exactly the same experience when Craig went to Leicester and I came in [in 2004]. “It’s difficult when you first come in to try and change too much, especially if the team has been successful. If you change everything drastically, and results don’t go as you think, people say you’re changing too much. So you try and tinker with one or two things and then settle in. I think the break has come at a perfect time because it has given Ian and Austin five games to really look at the squad and asses it ahead of the January window. And it has given the players a chance to go and recharge the batteries. “Speaking to a few of the lads downstairs, we’re really looking forward to seeing what’s going to happen. There will be more changes added to training, there will be more thought process going in. Will there be a change to the style of play? Not really. That’s the ethos that Craig has brought in. The new head coach will continue to play a similar style. Robbie implemented it first, very successfully, and Ian is of the same nature and thought process. It’s about passing and playing out. “There will be subtle changes. Every coach has a subtle change, there is no doubt about that. That’s what we are all looking forward to seeing. Do I see there being massive changes from now till the end of the season in the style of play? No because that’s not the plan. • Three Hearts youngsters have extended their respective loan deals until the end of the season. Lewis Moore, 18 – who has signed a contract to stay at Tynecastle until 2019 – will remain at Cowdenbeath, Callumn Morrison, 17, will stay on at East Stirlingshire while 19-year-old Alistair Roy has also extended his deal at Stenhousemuir.